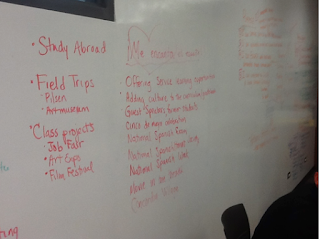 The Elk Grove HS Spanish PLC team of Leslie Guimon, Pam Coté, Carmen Ruíz, Effie Kalkounos, Diana Cappelen, Ricky Castro, Dean Burrier Sanchis and Chris Cirrincione came together for a full-day department meeting in the CollabLab this past Monday. Our scope was very grand as we set out to establish our standards of expectations for our department, analyze our global approach to assessments, grading, gradebook setup, rubric usage, student engagement and overall department goals. Amazingly, we addressed and came away with some great tangibles for each and every one of those areas. Our fearless PLC leader Leslie Guimon took copious notes on the walls of the CollabLab, to the point of literally filling the entire wall, a testament to all that was accomplished. 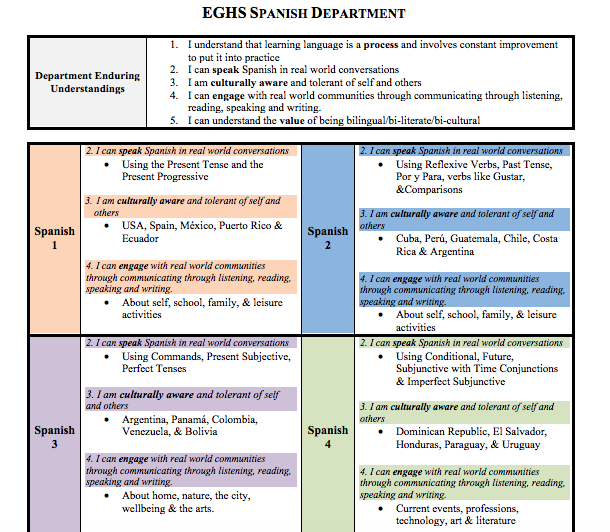 After creating this set of standards, we went through our assessment categories in our gradebooks and revamped our department wide setup to better reflect the new Enduring Understandings we had created. 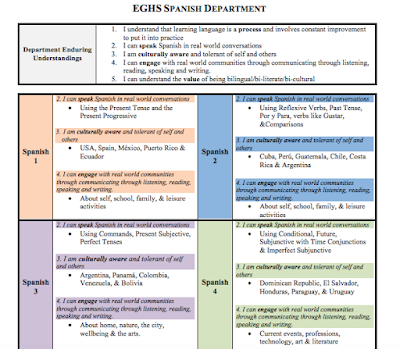 From there, we went through a backward alignment process from AP down to Spanish 1 to explicitly define the areas and ways we would be addressing the Enduring Understandings as well as our goals and curricular connections to the Understandings at each of our Spanish levels. Leslie’s notes document just how much we were able to accomplish. Chris Cirrincione took notes electronically and created a great visual representation of our results for today. Pam Coté treated our team to lunch where we continued our ongoing dialogues and renewed our energy. We found the environment of the CollabLab to be very well designed to fit our needs and handle our team’s drive and inspiration. Additionally, Linda Ashida and Kirsten Fletcher helped by adding their support and perspective to our conversations adding their vast experience and pedagogical knowledge, much to our benefit, as well offering suggestions for the uses of technology.